Why doesn’t DIRECTV carry my local channel? “Too much is never enough.” So goes a recent song, and it’s a very true statement when it comes to satellite TV. There has never been a time before when you could get as much entertainment on one wire as you can today. Satellite TV services like DIRECTV and DISH lead the pack with thousands of channels, including locals in nearly every market. But, it’s never enough. If you’ve been reading this blog a while, you know that while your pay-TV company carries quite a few local channels in your area, they don’t come anywhere close to carrying all of them. A typical mid-sized market will have about ten local channels delivered via satellite, while there are usually over 50 different channels available over-the-air if you include subchannels. Why is this? The almighty dollar is behind the decision on what channels get carried and what channels don’t. You’re probably not surprised by that. However, you might be surprised by the different ways money comes into play. The first time that money enters into the equation is the cost to actually carry the channel. Just because you can get it over-the-air for free doesn’t mean your satellite company can give it to you for free. Since the 1990s, local broadcasters have had the right to charge for their content. Before that it was more or less free and broadcasters sometimes even paid to make sure that they were on a good channel in the cable TV lineup. Today, a large portion of a TV channel’s income comes from “retransmission fees,” the money paid by cable and satellite companies for the right to air their channel. If you’re going to quadruple the number of channels you carry, you’re going to pay a lot more in retrans fees. Maybe not four times more, but a lot more. Another important consideration is the actual capacity on the satellites. Right now, DIRECTV carries about 2,000 local channels across the country if you include the HD and SD ones separately. That means 2,000 channels must be received, transmitted to one of several facilities, then bounced up to a satellite and back down. That doesn’t come cheap and increasing that number would potentially mean higher costs in the way of more broadcast facilities, more satellites, and more equipment. DIRECTV plans to shut down more or less all local standard definition channels next year so that would open up slots for about 800 more standard definition channels, but really, people want HD not SD. Some of the local channels you could get are SD-only so they might be a good fit in this case since that SD capacity doesn’t really translate out to a meaningful amount of HD. One surprising way that a decision is made involves advertising revenue. You may not know this but AT&T actually substitutes a lot of commercials that you see with their own ones. That’s pretty obvious when they’re running a commercial for themselves, but they’re also selling their own ads and putting them in place on the programs you watch and record. The choice of what channels to carry is partially due to the ad revenue they can generate. If there’s another channel out there, a decision has to be made if AT&T will put on their own commercials and how much more money that will bring in. If the cost to carry it is more than the revenue that comes in, they’re not likely to carry the channel. A lot of what happens in AT&T’s customer care centers actually matters. If you call up and say, “I want my Antenna TV”, it actually gets logged. When there’s significant demand for a channel, and especially if not having the channel is a reason people leave, it does make a difference to how much AT&T is going to pay for that channel and that can make a difference to whether or not it’s carried. There’s one way to guarantee that every channel available to you over-the-air is available on your TV, and that’s to add your own antennas. Antennas are immune to rain fade, they have no monthly cost once you buy them, and they last for years. Why not fill your TV with tons of content you didn’t even know was there? 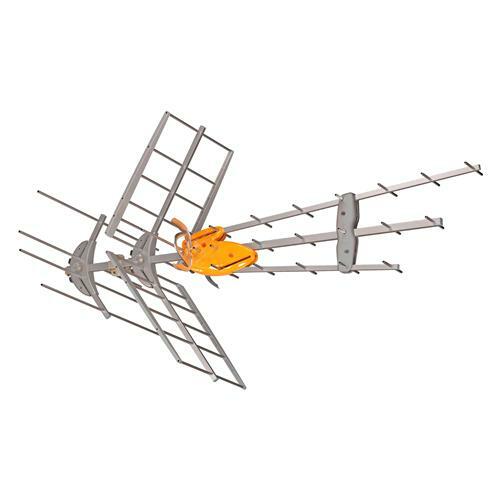 Get a TV antenna from Solid Signal today.